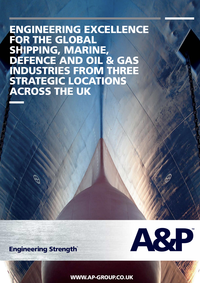 Global ship repair, conversion and marine specialist A&P Group has a proud history of quality-driven engineering and marine excellence spanning six decades. With far-reaching capabilities from our four UK locations, we combine a rich heritage of marine engineering skills and experience to provide ship owners, governments and energy companies with all the precision skills needed to complete the most demanding projects. 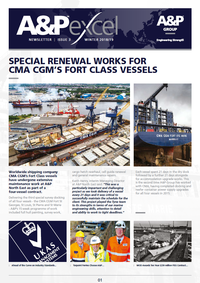 As the largest commercial ship repair and conversion specialist in the UK, we have earned an enviable reputation for delivering engineering strength across the commercial marine, major fabrication and defence sectors. Our vision is to continue to build our core business in support of global shipping and the maritime and oil and gas industries, and to deliver engineering strength to the emerging civil nuclear and renewable energy sectors. The combination of a highly skilled workforce and management team, first class waterfront engineering infrastructure and exceptional customer focus and care underpins these aims. Health and safety is at the heart of our business and a critical component in determining the future growth, success and reputation of A&P Group.